I’m really enjoying a new relationship with someone I don’t know at all. Many of our interactions with strangers are depressing: profane graffiti, the person who steals my parking space, dogwalkers who leave doo doo on my lawn, and pick pockets. It is a refreshing switch to be affected pleasantly by an unknown other. I have found a wonderful place to walk. Though it is in the middle of the city, the path follows the river and is sunken in thick woods. Each time I walk there, the path is decorated differently. Someone has been this way before me, leaving roses on a tree stump, arranging logs and limbs artistically, arraying pine cones and berries on a dead branch. These arrangements are subtle and pleasing to the eye. Sometimes they are obvious. Sometimes, they are tucked away in the trees and I have to really look for them. Other times, I feel a slight dissonance and realize I’m looking at pinecones hanging…from a maple! I look closer to see that these were artfully attached to the branch. 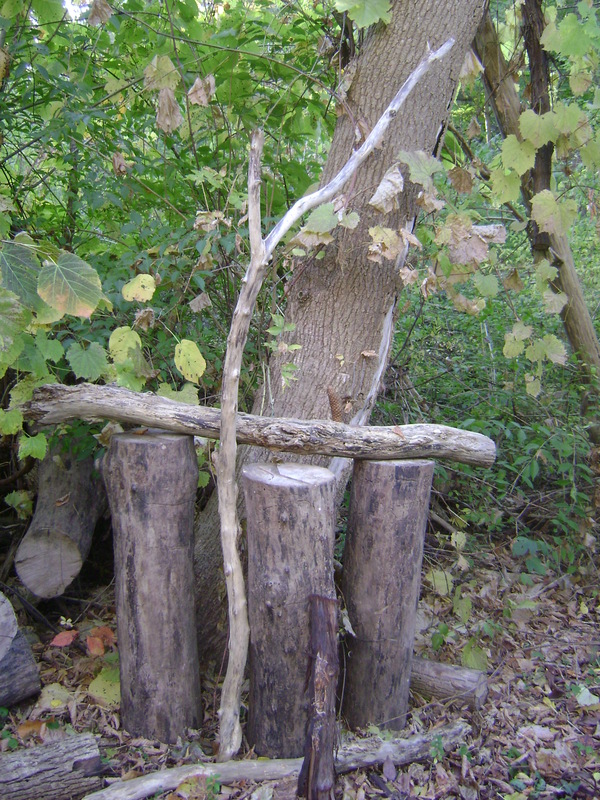 Often, these arrangements appear to me to be woodland altars. Perhaps I’m reading too much into them. Whatever they are, they delight me. I picture the artist coming along the river path at dusk or maybe dawn. I assume it is a female who decorates these woods. I sometimes see her as a high school senior, driven by hormones to express herself so fully and beautifully. Other times, I see her as a woman in her forties, coming out in the early morning, while her children are still in bed, and playing; decorating the woods just for fun – fun she might not get any other time of day. Once in a while, I know she is a compulsive designer, who must arrange things wherever she goes because it is simply in her blood to do so. This is how she put in her ten thousand hours to mastery of design and the artful arrangement of what is at hand. Whoever she – or he – is who decorates the woods along the Rouge River, I am uplifted every day by the artistry. Simply inspiring to read, and open me up to the experience, learning to appreciate the beauty of life, whatever that may be on my way… Thanks! Whoever this person is she is not unknown to you at all. She sees beauty that you see however hidden or dissonant or compulsively designed. She uplifts her spirit and coincidently yours. Indeed you have a relationship with this artist. Such beauty!